What are you looking for in your next dining chair? It should be constructed from natural wood, preferably oak for a beautiful grain and heavy duty feel. Check. It should be well designed for both good looks and durability? Check. The dining chair should be modern but touch upon the organic designs so in-trend right now. Check. The Merano designer dining chair from furniture designer Alexander Gufler and European fine furniture manufacturer TON offers all of this and more. 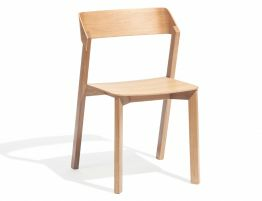 This modern oak dining chair is replete with an organic, natural style but it is also crisp and modern. The best of design is blended with the best of construction to give you a near perfect, stackable oak dining chair. Great for home dining rooms, upscale kitchens and even for commercial dining chairs, these stackable dining chairs offer ease and a luxe feel that is hard to come by in a stacking wood dining chair. Elevate your space with an on-trend, modern dining chair that has it all.